Groceries usually are one of the biggest expenses in a household budget. In fact, grocery items were the third largest spending category for my wife and I last year! Unfortunately, not everyone knows how to shop smart when it comes to buying groceries. Here are a few tips you can follow to help get your grocery spending under control. They’re not hard and you could easily save $1,000 or more this year if you just follow these tips. Every time you go shopping you risk buying something you hadn’t planned on buying. Even the strictest shoppers will occasionally see something at the grocery store and throw it in their carts. To cut down on the possibility of buying impulse purchases, simply shop less often. My wife and I normally go grocery shopping about once per week, but I’d love to get that down to once every two weeks! I personally think looking at the price per unit is one of the biggest money savers of grocery shopping. At many grocery stores you’ll see a price per unit listed next to the price. This allows you to compare different sized options of the same food to see which one is cheapest on a per unit basis. It makes it easier to get the most food for your money. You can also compare different brands of the same item on an even basis to see which one is really cheaper after you account for different packaging sizes. Be careful though, price per unit listings aren’t always consistent. For instance, one item may be listed in price per ounce while another is listed in price per 100 count or price per pound. Buying in bulk is a great way to save money at the grocery store. Most items get cheaper on a per unit basis for the larger package sizes. Sometimes manufacturers trick you into paying more for a larger box so always check the price per unit. Make sure that you’re only buying items that you eat often so they don’t go bad before you get a chance to eat them. Individually or specialty packaged items normally cost more than their normally packaged counterparts. For instance, individual size bags of chips normally cost much more than just buying a regular sized bag of the same brand if you bought the same amount of chips. This tip is also applies to things like shredded cheese, prepackaged salad kits, sliced fruit and other items that are packaged for convenience. You’ll pay more for this special packaging and increase the amount of wasteful packaging you throw away, too. Making a list is a huge money saver, but only if you stick to that list. Making a list helps you to only buy the items you really need, rather than the impulse purchases that grocery stores are trying to get you to make. Impulse purchases make the grocery stores a ton of money and can cost you quite a bit of money, too. Check your pantry, refrigerator and freezer before you head to the store to make sure that you don’t already have the items you put on your list. Then, think ahead to the next week to make sure that everything you need is on the list. Sticking to the list will make your budget happy. One of the biggest ways my wife and I save money on groceries is buying generic or store brand items rather than the name brand items. Most of the time, we can’t tell a difference at all between the off brand and the brand name products. If we can tell a difference, sometimes we like the off brand better. In the rare case that we like the name brand better, we go ahead and splurge for the name brand product. Overall, I’d say about 75% of the items we buy are not name brand and we save a lot of money because of it. Prepared foods cost more money and probably aren’t as healthy as non-prepared foods. You’re paying for the time it took someone to cook the items, plus the profit the company needs to make. Instead, just buy the ingredients and make the prepared food yourself if your grocery budget needs to be cut back a bit. I totally understand why you want to shop at the nicer grocery stores like Wegmans or Publix, but you pay for that nicer experience in your grocery bill. If you really want to save money on groceries, you need to shop at the discount stores. There is nothing wrong with the food at stores like Walmart or Aldi, it just costs less because the shopping experience isn’t as pleasant. We personally shop at Walmart and I’m always shocked how much groceries cost whenever I have to pop in to Publix for something. If you shop at Walmart like I do, then you absolutely have to be using Walmart’s Savings Catcher app. Simply scan your receipt inside the Walmart app and they will compare your purchases to advertised promotions from other stores. If Walmart finds a competitor that offers an item at a lower price, you get a refund in the form of a gift card. It’s a pretty sweet deal and requires almost no work at all. Even with Walmart’s Savings Catcher, it always pays to be proactive and catch deals yourself. If you know another store is offering a product at a lower price, Walmart will match the price at the register. This way you don’t have to rely on their app finding a better price, which doesn’t work 100% of the time, and you can be 100% sure you get the best price possible. Other stores may offer price matching as well, so make sure to check and see if your favorite grocery store price matches. If they do, you could save a good bit of money and avoid the hassle of shopping at multiple stores to get deals. Meal planning has been growing in popularity and with good reason. Meal planning allows you to figure out what groceries you’ll need for the week which allows you to stick to a list in the grocery store rather than figuring out what to cook when roaming the aisles. Additionally, meal planning will help you cut down on food waste. Since you know what you’ll be making, those random ingredients that you used to buy but never actually used will no longer be purchased or wasted. I totally understand that coupons can help you save money when shopping, but you have to be careful. Many items have cheaper off brand alternatives even after discounts from coupons are applied. Additionally, buying an item just because you have a coupon and not because you need it will almost always end up with wasted food and wasted money. A common problem with coupons is the fact that they cause you to buy items you wouldn’t have otherwise. Coupons are a form of marketing and, if you aren’t careful, you’ll end up spending more money after getting hooked on an expensive item because you had a coupon the first time. Shopping hungry isn’t a good idea. If I go shopping when I’m hungry, I come home with all sorts of junk food and other food items that weren’t on the list. They looked awesome when I was hungry, but we didn’t need them. Instead, go shopping after you’ve recently eaten to make sure you stick to the list. Your purse or wallet will thank you. Whenever we go shopping I always check the expiration date on the milk to find the gallon or half gallon that will last the longest. However, you should be doing the very same thing with any food item that goes bad in a short period of time. Now I check the expiration dates on anything that normally sits in our pantry or fridge for more than a few days. Whether we’re buying bread, cheese or meat, I check to make sure I’m getting the freshest possible item that will last the longest. Doing this allows us to reduce our waste since the food won’t spoil as fast, giving us a longer period of time to eat it just in case we don’t follow our plan. This tip is so important to help you save money when grocery shopping. Don’t buy more than you’ll eat. Even if an item has a lower price per unit in a larger size, if you won’t eat all of the food before it goes bad, you’ll just end up throwing it out. Anything you throw out is a complete waste of money, so sometimes it makes sense to pay more on a price per unit basis because the overall price will be lower and you won’t have any food waste. Same thing goes for buying items in bulk. It may seem like you’ll save a ton of money, but if most of the food goes bad before you eat it, you’ll actually lose money. Saving money on groceries is easy, but it isn’t always fun. Sometimes it takes a bit of work. Other times, it just takes willpower to avoid buying items you know you don’t need. 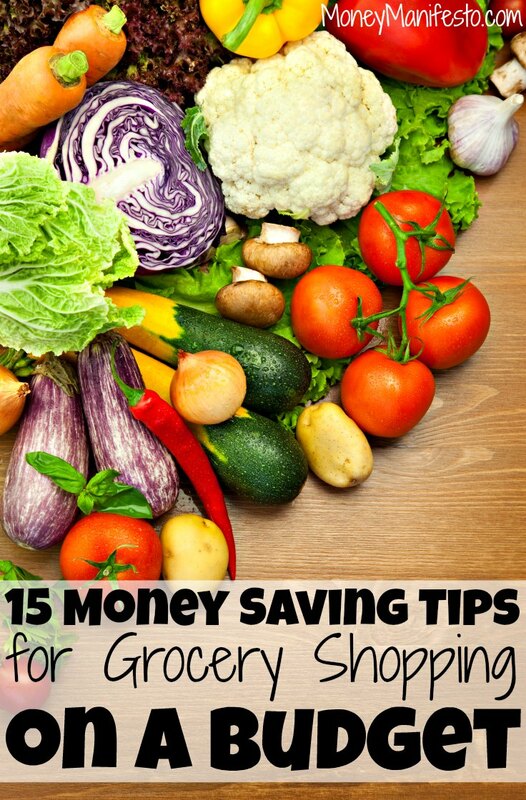 The list above should have something to help everyone save at least a little bit of money on their grocery budget. If you follow all of the tips above, I bet you could easily save $1,000 or more a year versus shopping haphazardly like most people do. I know I can think of many more fun things to do with $1,000 than spend it needlessly on groceries. How about you? What is your favorite money saving tip above? Do you have any other money saving tips for grocery shopping on a budget I should add to the list? Let me know in the comments! Shopping while hungry is my downfall. I tend to grab tons of food I don’t want, and it’s usually unhealthy food. To solve for this, my wife and i go shopping together now and it’s right after dinner. Sounds like you figured out a solution. Looking at the Price Per Unit is my favorite trick to use here. I estimate that comparing similar products in this way saves me roughly a few hundred dollars a year alone. It is always interesting to see when the larger sized items are actually more expensive per ounce than the smaller sized packages. I always used to do the math in my head or on my phone before purchasing. Thankfully they started putting these on the stickers in a lot of places. I did the same thing but I am very glad they put them on most labels now.